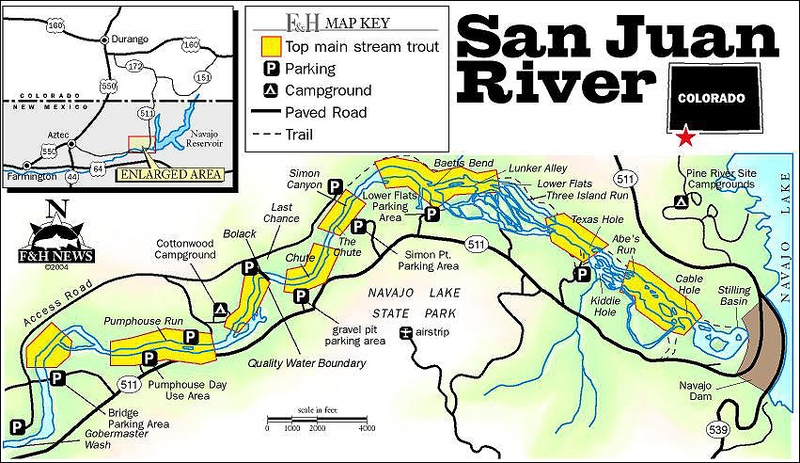 The San Juan River, located in Northwestern New Mexico, is one of the most famous tail-water trout fisheries in the world. Gushing out of Navajo Dam, the San Juan’s most productive trout stretches are from the dam downriver 3 plus miles to the NM Highway 173 Bridge. The San Juan averages approximately 140 feet in width. Trout thrive further downriver; However, public land access is very limited, fishing via drift boat is the best way to access the lower stretches. The river flows through a broad sandstone canyon, the floor and riverbanks are scattered with willows and cottonwoods. Navajo Dam is a bottom-releasing dam; the outflow is approximately 200 feet below the surface of Navajo Lake. The San Juan maintains a constant year round water temperature between 42-46 degrees, making this a fabulous winter fishery. The constant temperature provides a year round insect population and growing season for the rainbow fingerlings stocked throughout the year. New Mexico Game and Fish estimates the fingerlings grow 4-6 inches per year. Flows on the San Juan are not prone to sudden fluctuations. May and June usually have the highest flows often-reaching 5,000 cfs. By late summer flows often drop to 600 cfs with winter flows as low as 250 cfs. 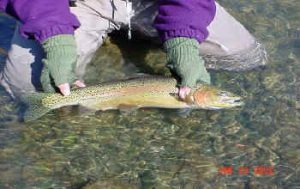 Rainbows consistently in 15-20 inch range are stacked throughout the upper 3 plus miles that are designated as Special Trout Waters. Trout are everywhere on this river and they don’t spook easily perhaps so use to the thousands of anglers that fish here each year. The heaviest populations are often found in the long deep runs below fast riffles found in Texas Hole. The deep holes in the Upper and Lower Flats, the many channels, sloughs, large eddies and low velocity lenses all hold healthy populations of rainbows. Daily hatches occur on the San Juan River however, the species are dependent on the time of year. Hatches are normally midday usually between 10:00 AM and 4:00 PM. Even though these midge and/or mayfly hatches can be enormous at times, the fish prefer to feed on the nymph rather than the dry, unless conditions are perfect. 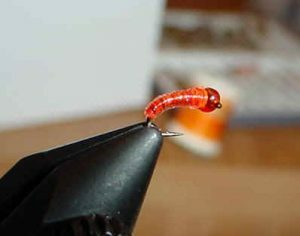 The best days to fish midges and Baetis on the surface are the windless and overcast ones. Add a little drizzle and things could be perfect. For the PMD’s, a nice bright sunshiny day with a tiny breeze is the best. 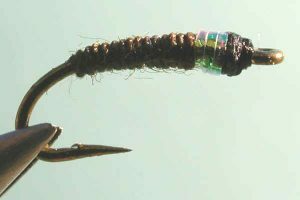 The one constant food source for the rainbows abound throughout the river and anglers should have a box dedicated to midges with every possible pattern and size representing the various life-stages. Anglers should also be aware of other foods: mayflies, caddisflies and annelids. Blue Winged Olives (Baetis) hatch twice a year, in the spring and then again in the late fall. The BWO hatch provides wonderful dry fly fishing especially on cloudy days. The trout in the Juan are beyond picky they define selectivity. Proper presentation is a must. These fish have seen just about every fly invented. Proper gear is essential here. Rods should be 9 foot 4-6 weights to help with mending and heaving lots of weight. 9-12 foot leaders with 5X-7X tippets are required. Wading the San Juan can be exhilarating; the rocks are rounded and covered with a film of algae. Chest waders with felt soled wading boots are vital. The San Juan below Navajo is one of the best year round fisheries in the country. With constant 42F water temps the fish continue to feed all year, at an elevation of just under 6000 feet, the climate tends to be less severe than many trout waters. Most springs see increased flows and somewhat off color water conditions. Even at peak flows of 5000 cfs the river can fish well. With high water conditions floating is always a good option, but wade fishing is still possible in some areas. Summer and fall tend to be very consistent, with good insect activity and moderate to low flows.Although weather in the winter can be severe at times, it’s amazing how many comfortable days there are for those properly prepared for these conditions. There is no closed season to the fishing on the San Juan. Below the Quality Water standard NM state regulations apply. 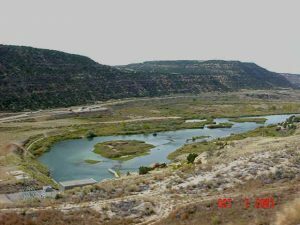 The tailwater of the San Juan starts below Navajo Lake on the Colorado/New Mexico border. Primarily a rainbow fishery, the first ½-mile below the dam is catch-and-release water. Below this the regulations allow you to keep one fish over 20 inches, but I’ve never seen anyone kill a trout here. Fish average 16 inches — no, that is not a misprint — with 20-inchers fairly common. The trout are big and plentiful, and make for an interesting but not impossible challenge. The weather is cool, sometimes cold at night, but usually sunny and pleasant during the day. There are two distinctive types of water here and each fishes quite differently. Facing upstream, the main current runs to the left. This is big water, 3 to 8 feet deep, with swift runs over gravel and boulders. On the right side are a series of braids and side channels seldom more than 2 feet deep. They, like the main channel, are full of fish. I’ll discuss fishing the main channel in this article, and fishing the shallows in the next issue. To access Cable Hole, park at the lot closest to the dam just beside Highway 511. There is a modest parking fee. A trail leads across marshland and a side channel, then bears to the right to reach the large open area of water known as Cable Hole. Below a cable hung across the river is a gravel bar emerging from the middle of the river. To the left of the bar (looking upstream), the main flow forms a swift run. To the right the water forms a slower run emptying into a fairly deep pool. The waters of both runs merge over a series of shallow gravel bars with modest holes before being forced mostly to the left by a small island. This complex is full of rainbows and is a very popular place to fish. When on, it can truly be spectacular. One February afternoon I caught two 25-inch fish on successive casts just above the little island. When off, it can drive you crazy. You can see large trout moving about feeding, but no fly or presentation you have will tempt them. To fish the Cable Hole area I use a two-fly nymph rig. Tie two size 26 gray, brown or black midges on 6X tippet about a foot apart. Place a split shot 6 inches above the top fly and a strike indicator on the leader about 6 feet above the sinker. Cast the rig upstream and mend a lot to get a natural drift. Your flies should be ticking bottom, bringing up some moss occasionally. Look for current breaks or spots where the water flows over shallow gravel into somewhat deeper, slower water. A number of anglers are always working this popular hole, fish are not spooked by them. Getting out on the San Juan River tailwater during the winter months for some amazing fly fishing for big trout. The San Juan River tailwaters below Navajo Lake. There are several distinct fisheries here between the main river and the shallow water channels, all chock-full of healthy ‘bows. February and March can provide some incredible, although challenging, fishing. Small flies are the key on this catch-and-release section of river. There are times where bigger nymphs will work, but mostly you’re talking sizes 20 to 26. Often you’ll want to fish them in a two-fly set-up. For more information and accommodations, contact Abe’s Motel and Fly Shop (505-632-2194) or Rizuto’s (505-632-3893). One of the best equipped fly shops in the west is Float ‘N Fish (505-632-5385). They all provide excellent guides. To reach Texas Hole, drive downstream from the dam on Highway 511. The first side road to the right leads down to the parking lot. Texas Hole is the largest, most productive hole on the river. The water runs swiftly through a narrow gap into a huge pool that is 8 feet deep or more. To the left of the fast water is a huge backwater eddy; to the right (on the parking lot side) is a smaller inlet around an island and a smaller eddy. This complex set of currents provides several opportunities to fish. On the right side, you can wade and fish the edges of both the main and side channels. Lower down you can fish the current where the back eddy meets the main current. Wade carefully across the main channel well above Texas Hole to fish the big eddy. The main current is too deep to wade but you can use a drift boat or a personal pontoon boat to fish. To fish Texas Hole, rig your line with a fairly heavy weight, a big strike indicator and at least 8 feet of leader between the weight and the indicator. This will get you down to where the fish are. In addition to tiny midges, this area supports little red worms, as well as bigger nymphs and worms. 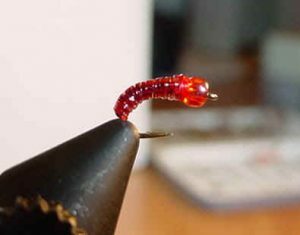 The famous San Juan worm fly works well here. In the morning, guides on all-day drifts put in here. They row up to the left side of the main current, have their clients cast to the edge of the current and drift downstream, often hooking a fish each drift. It’s quite a sight to see. As one boat drifts downstream the next guide moves in. At the end of the drift, each guide moves their boat to the left and rows back up to the head of the pool for another drift. Several drifts through this area will usually get their clients some good fish. By midmorning most of the guides have moved on, but the fish are still feeding. Copy the drift with your pontoon boat. You should catch a lot of fish. Below Texas Hole is a long flat. It looks deep, and it is in some places, but there are shallow bars at various locations along shore. Behind these bars are deep holes. Fish will feed where the shallow bar drops off into the deep water. Use your Texas Hole nymph rig here too. In the early afternoon there may be a blue-winged olive hatch. A size 20 comparadun often works well. Below this flat the river divides again, with most of the current flowing to the left along Three Island Run. This area consists of deep runs similar to those below Texas Hole. Next the water opens into a large flat with fast water running over shallow bars, like you found at Cable Hole. 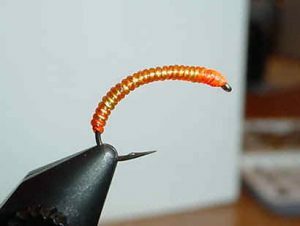 Fish it with the Cable Hole rig, but try some slightly bigger flies. The last fast, deep run, known as Lunker Alley, is just below this flat. It’s difficult to wade. The fish are almost always just a little beyond my casting range. Also, the currents are complex, making it difficult to get a good drift. Most anglers use flies, but I saw one spinfisherman who was very successful at Cable Hole. He was casting a weighted jig upstream and allowing it to bump the bottom as it drifted down the run. I’m sure that would work in Texas Hole and the other spots I’ve told you about. The weather is usually in the 40s and standing in the cold water can quickly bring on a chill, so dress warmly with wool socks, long johns under your waders and a knit cap on your head. By afternoon the sun will warm you nicely. The San Juan below the Navajo Dam is a trophy rainbow river with excellent access and year-round fishing. The San Juan River in New Mexico is one of the finest tailwater fisheries anywhere! Soaring Eagle Lodge offers first class lodging, fly fishing guide service, fly shop, and private land access on the San Juan river in Northern New Mexico. 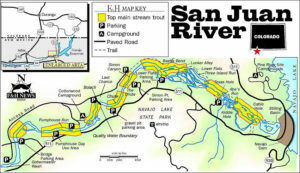 San Juan River on-line discussion board.